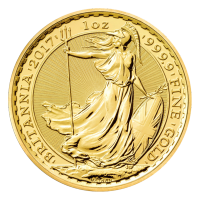 1盎司2017年不列颠金币 Purchase a 1 oz 2017 Britannia Gold Coin online at the best price. New for 2017, this 9999 pure gold coin features a sunburst pattern of radial lines as an anti-counterfeiting measure. A symbol of its country and heritage, this coin with the Lady of the Sea is one of the oldest coin designs in the world. The imagery dates back to the Roman times and is one of the most recognizable coin designs of all time. With both sides featuring dentils on its border, the obverse features an Ian Rank-Broadley effigy of Queen Elizabeth II and the words "Elizabeth II DG Reg Fid Def 100 Pounds" . The reverse features a design by Phillip Nathan of a standing Britannia with a shield, trident and an olive branch and the words "Britannia 2017 1 oz 999.9 Fine Gold" and the artists' last name "Nathan". A valuable investment or gift to your loved ones, the 1 oz gold Britannia coins will always be in demand.